LOS ANGELES — On a warm November night at the Upright Citizens Brigade Theatre on Sunset Blvd., a room of more than 300 people watched as a cart carrying a frosted sheet cake was rolled on stage. 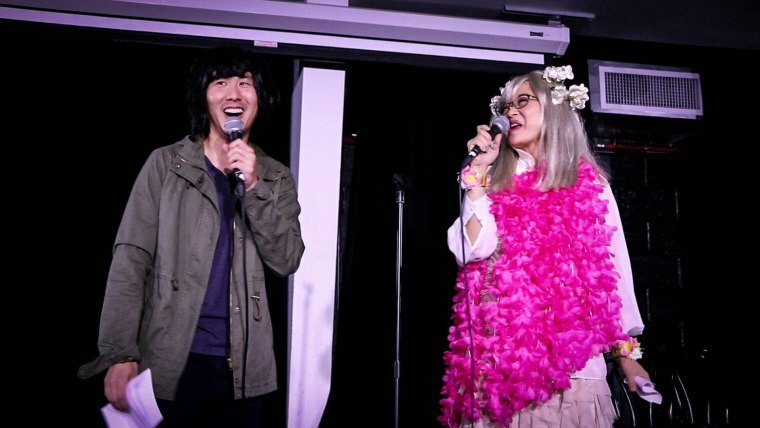 “It’s a yellow cake with white frosting,” comedian Will Choi announced as he led the room in singing “Happy Birthday” to his fellow performer Jenny Yang, who was celebrating her birth month alongside three actresses Choi and Yang had spent the night making digs at: Scarlett Johansson (whose name Choi borrowed for his sold-out UCB comedy show, “Scarlett Johansson Presents: Opening Night of Doctor Strange”), Emma Stone, and Tilda Swinton. The “Scarlett Johansson Presents” show in May sold out, prompting a second show in November that took place the same night Marvel’s “Doctor Strange” opened in theaters. Swinton’s role as The Ancient One in “Doctor Strange” had been another dart on the wall of Hollywood missteps when it came to casting actual Asian Americans in major film roles meant for Asian Americans, and Choi saw an opportunity to continue highlighting Hollywood’s problem in the way he knew best: through comedy and performance. While Choi’s philosophy isn’t a novel concept, the number of opportunities to respond to misrepresentation (and non-representation) in the media showed almost no sign of slowing down in 2016 — from Chris Rock’s “joke” at the Oscars involving three Asian-American kids to continuing concerns of whitewashing on the big screen. For Yang, the “low points” this year were part of the fuel for her bursts of creative fire. In September, after Bon Appétit published a piece on “how you should be eating pho” that featured a white chef demonstrating the “right” way to make and eat the Vietnamese dish, Yang responded not just with outrage, but with satire. Yang’s “How to Eat PB&J” video, which directly mocked Bon Appétit’s take on pho — or, as it’s known online, the “Columbusing” of pho — makes wild assertions about the proper way to consume and appreciate peanut butter and jelly sandwiches, and ends with a “pro-tip” on not telling Asians how to eat their own food. Since it was posted online, Yang’s video has nearly 900,000 views on Facebook. Bon Appétit has since removed their original video and amended their article to include an explanation. Although this style of comedy isn’t new for Yang — she’s appeared in numerous BuzzFeed videos commenting on the Asian-American experience — she says 2016 has given her confirmation that creating laughter could also create change in a meaningful way. One month later, Yang was back at it again, responding to a segment by Fox News correspondent Jesse Watters which saw Watters using stereotypes to poke, what Watters and Fox News called, “gentle fun” at Asians in New York City’s Chinatown. The segment, which was decried as “racist and offensive” by civil rights organization, included references to karate and questions about North Korea. In a video for Fusion, Yang responded by going to Beverly Hills, where she mimicked the style and tone of Watters’ segment, but turned the tables on interviewees with stereotypes about white people. Whether it’s been through improv or satirical videos, the media’s lack of responsible representation of Asian Americans continues to showcase the need for the kind of work Yang and Choi have brought to both stage and screen. It’s the kind of work that actor Neal Dandade, who performed in Choi’s “Scarlett Johansson Presents” show in November, says is essential in changing the industry. Dandade, who was most recently seen on TV in ABC Family’s “Kevin From Work,” got his first taste of the theater while in college, studying both theater and pre-med. After graduating, he moved to Chicago where he worked as a researcher in a lab, but also began taking classes and seeing improv shows at night. “I was very lucky in Chicago. I found some really cool people to make videos with, that’s usually how a lot of great videos start: it’s just people having fun,” he said. Along with his theater and television work, Dandade has appeared in videos for Funny Or Die and the Second City Network, the web portal for The Second City, whose alum include Tina Fey and Steve Carrell. Dandade himself is an alum of Stir Friday Night, a Chicago-based Asian-American comedy troupe that also boasts impressive alumni — for starters, actors Danny Pudi and Steven Yeun, who Choi cited as one of his biggest inspirations for getting into comedy. “Depending on how successful that is, hopefully it’ll become a monthly run,” Choi told NBC News at the beginning of November. One week later, tickets for the show went on sale; four days later, it sold out. "The title 'Safe' is a reference to how I felt Asians and Asian Americans were being perceived: the model minority that'll take it and smile, the punching bag of America," he told NBC News at the time. Dumbfoundead’s music video for “Safe” went viral in the first few days of its release. And while he uses humor by superimposing his face into iconic movie scenes (it’s a creative move also used in the viral hashtag #StarringJohnCho, which superimposed actor John Cho onto movie posters as a lead role to push back on those who might suggest Asian actors weren’t leading men, according to hashtag creator William Yu), the message is deeper: “What you talkin’ ‘bout there ain’t no space / Guess I gotta go and make more space,” Dumbfoundead raps in the song. Ahead of the release of “Ghost in the Shell” in 2017, Choi already has a third “Scarlett Johansson Presents” show scheduled — this time, in February on the opening night of “The Great Wall,” an action film starring Matt Damon that has Damon’s character saving China from dragons. “ATTN: ASIANS - Meet at the UCB Theatre on February 17th, 2017. Matt Damon is coming to save us all,” the Facebook event reads. Choi’s committed to that model of letting his opinions speak through his art: with another “Asian AF” show lined up already in the new year, he hopes to use the stage to help comedians and performers catch the eye of agencies and producers who claim to be on the lookout for diversity. “Let this place, this show, be a place where you can find that talent,” he said. “Making your own work puts you in the driver’s seat." And while every joke in Choi’s shows or Dandade’s web videos or Yang’s sketches aren’t always direct jabs at Hollywood’s fumbles, having the platform and opportunities to create — to perform, to watch — and to laugh at an industry that still hasn’t figured out how to properly support diversity is as important as any other means of demanding change.